Despite our national myths, the poor, or as they are called in a new book, the trash in America, have been a constant in our national fabric. They have been the low paid workers, the old and the very young, the disabled, and often many of them veterans. In 1963, Michael Harrington called them the invisible people in America. We don’t really need to see them and if we don’t see them, well, then they don’t exist. They are not our responsibility. 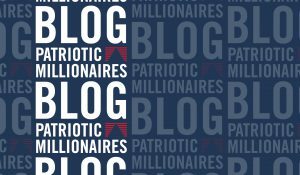 At the Patriotic Millionaires, we understand that poverty is something we see – we see it when our businesses have no customers, in the way our tax dollars are used, and when the people in our communities do not have the ability to invest in their community. We very much see the poor, we see an issue of inequality that is affecting all of us and prohibiting the strengthening of a nation. Another powerful force came into play in 2012 that has made a major change in the nation’s knowledge of the poor among us. The Nuns on the Bus! … Who are they? … What exactly do they do? Nuns on the Bus are part of the 40 year social justice organization called Network, a Washington based organization of Catholic sisters who lobby – and yes, some of the nuns and lay staff are indeed registered lobbyists for the poor in America. I was lucky enough to learn very early about the Nuns. Ben Palumbo, a board member of the progressive lay organization Catholics in Alliance for the Common Good, and I were having lunch with Sister Simone Campbell, the head of Network, in Spring of 2012. She wanted to tell us about an idea she had. She said she wanted to see a group of nuns who would go on a bus tour aimed at shattering myths about the poor. The nuns would invite others to join them, and in time, bishops. Everyone was welcome to hop on and tour the country. The bus would go to homeless shelters and day care centers and to soup kitchens where poor people would get their only decent meal of the day. All in order to make the invisible poor visible to Americans. He and the rest of the nation were soon to find out. In the presidential election year of 2012 they began their tour in Iowa and traveled some 2700 miles. Combining compassion and media smarts, they invited local religious leaders of all faiths to join in their mission to make the poor visible. Local media and the nation took note. Nuns on the Bus went to Racine, Wisconsin, the congressional district of then Budget Committee Chair Paul Ryan to show him and his constituency the depth of poverty in their homeland. This was a particularly striking stop, which helped gain an invite for the Sister Simone to appear as a featured prime time speaker at the 2012 Democratic Convention – where she eloquently spoke about the vulnerable in America. Nuns On The Bus has been mending the gaps ever since. May their holy work continue as they – together with other Catholic organizations – promote the words and spirit of Pope Francis in America. And regardless of faith, may all Americans join them in recognizing poverty and the need to close the inequality gap.